Sophia E. Fink was the sixth child born to Daniel Fink and Elizabeth Beaver. Sophia was born about 1844 in Rowan County, NC. 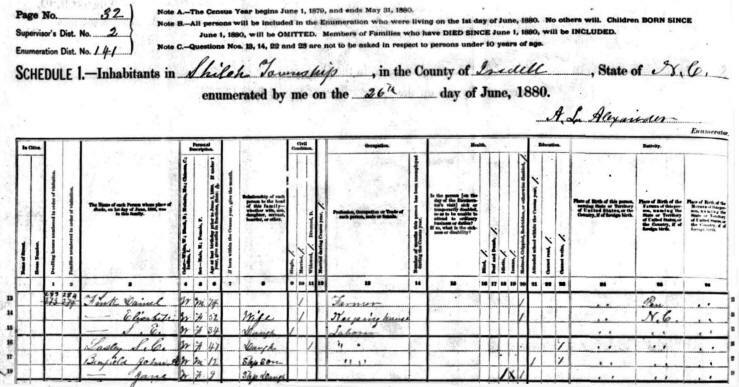 The 1850 Iredell County Census shows Sophia Fink as a 6-years-old and living at home with his parents and all of his siblings. The 1860 District South of the Yadkin Census for Iredell County shows that Sophia was 16 years old and living at home with his parents and siblings. Older brother David Alexander had left the family home and was living by himself in the Rocky Creek District of Iredell County. By 1870, Sophia was 26 years old and still living with her parents and sister, Susan, in the Shiloh Township of Iredell County. 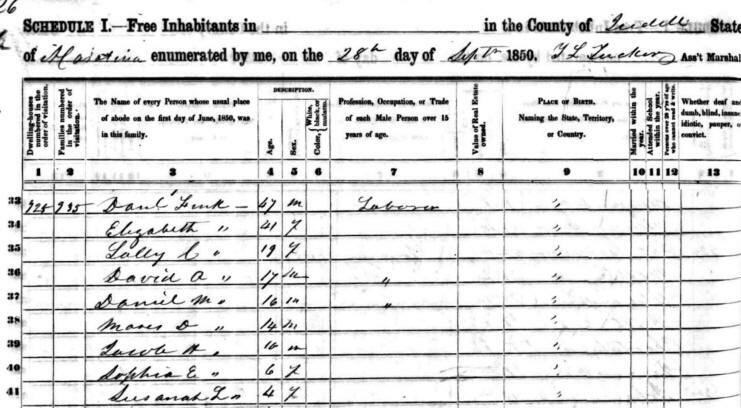 In 1880, the Census lists Sophia (S. E.), age 34, still living on the family farm. Her father, Daniel, had remarried to a new wife, whose name was apparently also Elizabeth. This Elizabeth was considerably younger than Daniel and the Census lists two step-children living with the family. Sophia's sister, Sarah/Sallie Leslie/Lasley, had returned home after the death of her husband. Sophia married Jules Hall. According to the 1910 Census, Jules was born about 1856 and was seven years younger than Sophia. This Census lists this as Jules' first marriage, but Sophia's second. She had two children but only one was living. Also living with the family was Bessie Fink, widowed Sister-in-Law. Bessie was the much younger wife of Moses David Fink who had died earlier that year. There was also a single niece, M. Benfield (age 25), who had 1 child (more than likely Robert, age 1 5/12) living with the family. Could this have been a daughter of Sophia's sister, Susanah, who married Lee Benfield? 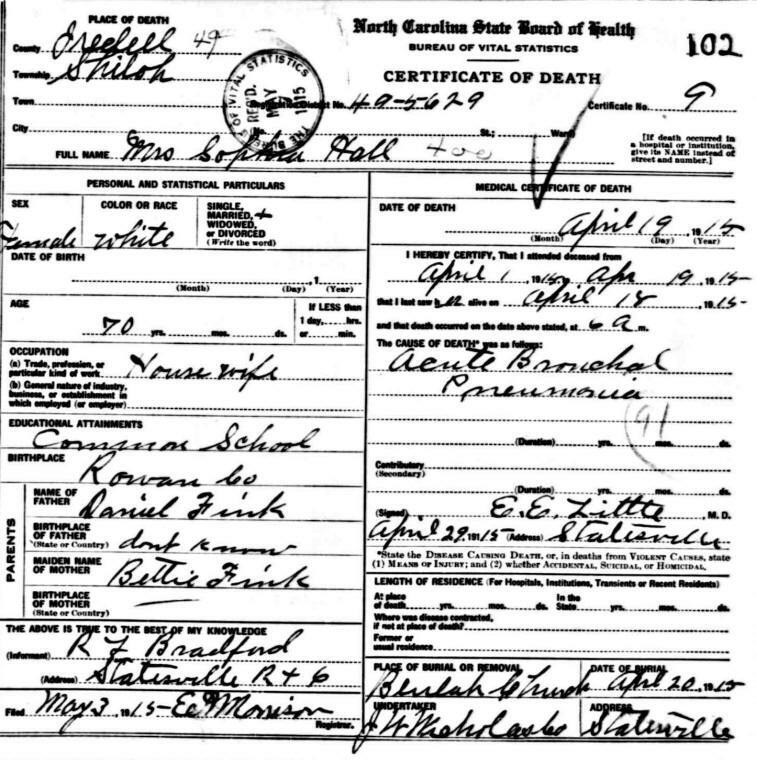 Sophia E. Fink Hall died 14 Apr 1915 in the Shiloh Township of Iredell County, NC, from pneumonia.